Goat's Curd, Honey and Walnuts Crostini. As a city girl living in the vibrant heart of London, I harbor an occasional fantasy to leave this heavily populated place behind and go raise goats in the countryside. More often than not, this feeling is fleeting after a weekend trip as we journey back to the place we love the most. But at least we've got the farmer's markets, where we have the chance to taste all those delicious local products. Last week I got some goat's curd, which I had never tried before and I actually found it a quiet amazing product. Being a big fan of goat's milk and French-style chevre, curd felt like a beautiful surprise. It has a mild, light and tangy flavour with a smooth, creamy finish and it is the perfect partner to both sweet and savoury flavours. It is nutritious too, filled with calcium and vitamins. If anything could convince me to actually make the city to country swap, goat curd would be a definite contender. Goats can continue to produce milk for many months after giving birth, making goat cheese a nearly year-round food. But early spring, when most goats are bred to give birth, is high season for goat cheese. That's why I though it would be the perfect timing for a recipe like this and as goat's curd is really fresh, it plays well with sweet and fruity flavours, making it the perfect pairing for honey. Slice the bread and arrange it on a baking sheet. Drizzle with olive oil. Sprinkle with a little sea salt. Arrange the walnuts in a single layer on a second baking sheet. Toast the walnuts for about 5 minutes, or until golden brown. Remove the bread slices after 15-20 minutes, or when crisped and golden. Allow the crostinis to rest until they are cool to the touch. 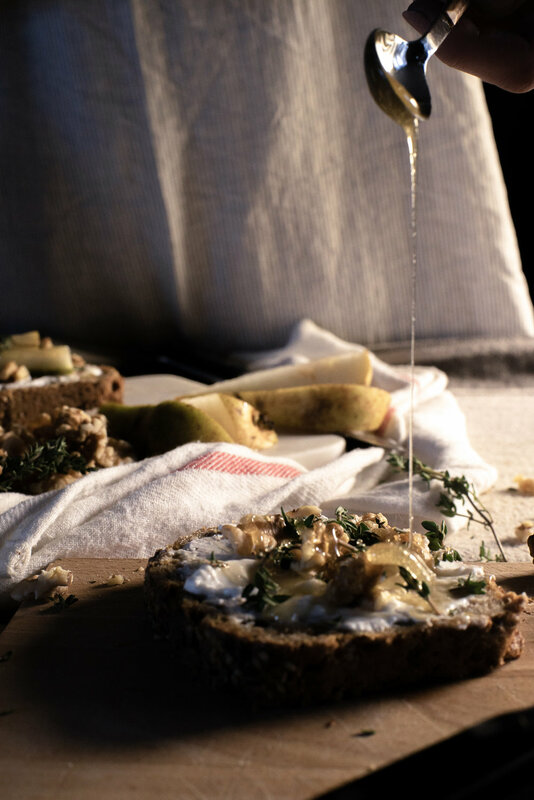 Spread a thin layer of goat cheese over the top of each crostini, top with walnuts and thyme and a drizzle of honey. Serve warm.